A Whirlpool Galaxy is one of the many close galaxy neighbors to the Milky Way. It was first discovered by Charles Messier in 1773. This spiral galaxy has a diameter of around 60,000 light years. It is located about 23 million light years away in the northern constellation Canes Venatici. The official name of this galaxy is M51a and also very commonly known by the name NGC 5194. The actual shape of this galaxy was recognized by William Parsons in 1845. It also has a dwarf galaxy neighbor named M51b. These two galaxies are believed to be slowly merging together. A Whirlpool Galaxy has a supermassive black hole in it which is encircled by rings of dust. It is similar to the one found in the Milky Way. The core of this galaxy is highly active and it makes a whirlpool which is known as ‘Seyfert Galaxy’ by astronomers. It is one of the two largest groups of active galaxies, along with the quasars. This galaxy can be easily observed using binoculars even under dark sky conditions. In February 2016, three different supernovas were discovered in the Whirlpool Galaxy. There is a bridge made of gas and dust that ties this galaxy and its dwarf neighbor M51b together. It is also the brightest galaxy in the entire M51 group. This group includes several other galaxies. The total mass of this galaxy is around 160 billion solar masses. Declan, Tobin. " 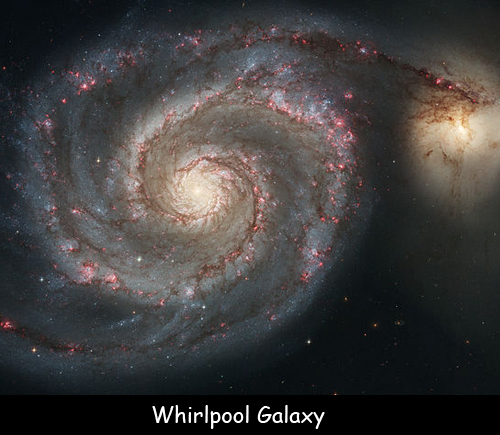 Amazing Facts for Kids about Whirlpool Galaxy ." Easy Science for Kids, Apr 2019. Web. 25 Apr 2019. < https://easyscienceforkids.com/whirlpool-galaxy/ >.